Leading Ladies & their Followers – a women’s only tango class! – Open to all women interested in learning to lead and/or being a follower for a woman lead. 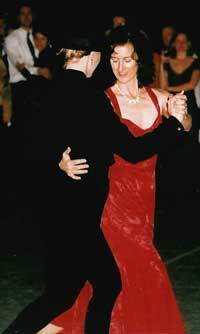 – No previous lead experience is required but previous orientation to tango as follower is recommended. – The class will cover both instruction on leading plus followers’ technique (for the entire class). – Half the participants need to be committed to learning to lead, and all participants should be up for improving their following. – Women will be free to exchange lead and follow regularly or on occasion, depending on their preferences. It is a good practice to try both sides fo the equation. – Since learning the lead requires focus and commitment, there will be suggestions for those switching on how best to share that role. Give this a try, and see if you like it! Cost: $15/$10 for students (at the door) but please try to sign-up in advance! If you are unable to attend on Sunday, but want to take the class, let me know! 6 or Less paid registrants = all classes will meet at Margaret’s Home studio (with carpool arrangements). Pre-registration Requested! Please indicate your role preference!